OK, let's talk about the Odyssey features I like. And that starts with the new mini-game. I love the new mini-game. And I dislike it. And it concerns me quite a bit too. But mostly I like it. But to explain where I'm coming from, I'll have to start from the background. Stay with me for a few minutes. Until Odyssey, running what are now called Data Sites and Relic Sites (love the new names) was pretty straight-forward... it was just boring. You rolled up to the can that you would activate an Analyzer or a Codebreaker against and then you'd activate it. And then you'd go get a beverage because unless you had fantastic skills, it was going to take ten or twelve or 15 cycles of the module to crack the container. Then you'd empty the can, motor to the next can and repeat, usually three or four times per site. Like I said... straight-forward and boring. If "straight-forward and boring" sounds like a lot of EVE PvE... I'll get to that. One of the biggest tent-pole features of the Odyssey expansion, the new mini-game is the replacement for that 45 or 60 seconds of boredom. And I have to say again that I love the new mini-game. And sure, this is coming from a guy that enjoys Slay and other mentally-challenging tactical turn-based games. Love 'em. This particular one is (IMO) engaging, at just the right level of challenge, and well-designed. And I'm not just saying that because I'm good at it. OK, I'm mostly not just saying that because I'm good at it. And if you're not good at it yet, CSM8 member Ali Aras has written an absolutely terrific starter guide to the mini-game. But that brings me to the first thing that concerns me about the new mini-game. It's great, it's fun, it's well-designed. But is it EVE? Back when the original Bioshock was released in 2007, it included a Pipe Dream-like mini-game that was also great fun... but it didn't quite fit with the rest of the game in the opinion of a lot of players. And that honestly is what we have here, I think. For a while, there were rumors and even a very crude prototype of an EVE avatar exploration mini-game where you explored the interior of a Sleeper station. And this hacking mini-game strikes me as the sort of thing that would have worked very well for that effort, re-purposed into EVE's spaceship game. So don't get me wrong, I think it's a great game. But I'm not sure it fits with EVE. And that brings me to the second thing that concerns me about the mini-game. To what, if anything, is it a prelude? The "game-play" mechanic that was removed from EVE to make way for the mini-game was a cycling mod that ate up anything from 45 to 90 seconds or more while you waited to "receive bacon", as the saying goes. Now you have to work for your bacon and if you don't work smartly, you receive no bacon at all. Before, you could relatively passively show up and as long as your ship was fitted correctly and your character had the right skills, you were eventually guaranteed the maximum possible baco-- er, reward. That describes any number of PvE mechanics in EVE, but the one that's the most interesting in context is mining. Mining operates very much the same way: it's a passive activity requiring only that you show up with the right fitting and the right character skills. Anything else you bring to the table is relatively superfluous. Sure, you can pick up a few percentage points of efficiency here and there through smart use of your mining lasers and a Survey Scanner but mostly it came down to ship fitting and character skills. "Make mining based more on player skills so that bots can't do it!" players have been screaming at CCP for a while now. No, I don't know that CCP is going with mini-games for other PvE content in EVE and if I did know, I couldn't tell you. But right now the mini-game is kinda hanging there in space, being completely unlike anything else that's hanging in space in EVE. A mining mini-game is not completely out of the question. That, perversely, brings me back to something else that I really like about the mini-game: the fact that it's so distracting. When the mini-game was first hinted at, I have to admit that my very first thought was "Yes yes yes, by all means keep people running data and relic sites focused on the mini-game window. That way, they won't pay attention to their Local window or their directional scanner window. That will make them far easier to catch and to gank." And things seem to be going just that way in the early days of Odyssey. Sure, it's a pity that you can't warp directly to data and relic sites. But it doesn't take that long to scan 'em down, particularly with the nice visual indicators both in space and on the star system map to help guide those initial few moves to scan someone or something down. And nowhere does the distraction get any better than the so-called "lootsplosion" that follows a successful hacking attempt. All those little green pixels darting in so many different directions. But it's got a fairly major down-side, too. Last night, I tracked down five straight relic sites with between three and five cans per site, something like 17 cans total. By the time I was done, my hand hurt. Coincidentally today, there's a post from what appears to be an older gamer like myself, complaining about the twitch and RSI nature of the lootsplosion. And I have to admit that I have a certain amount of sympathy here. I totally understand and support the idea of making running these sites a cooperative exercise. But now that I see the sites in action I'm not sure I care for how it was done. Nothing before the lootsplosion is cooperative in any sense of the word, other than a second person might be handy to watch Local and the d-scan for you. But they can't help you with the mini-game, they can't make suggestions about what path to take and their ship and fitting doesn't matter in the slightest, except so far as to scoop up all those little green pixels. That... I have to admit that I don't care for and hopefully we'll see some tweaking of this particular part of the design. I agree that the game has my hand hurting a bit with all those clicks. I can't confirm if you only have to single click the cans, but I explore solo, so I click away like a madman to ensure I get cans. But, I'm loving the mini-game despite this. It is weirdly addictive and distracting, and luckily I haven't been ganked...yet. I have been looking for an opportunity to play this part of the game more, and the removal of rats let's me do that solo, which I like in equal amounts compared to corp play. I feel like this is perfect for Eve, however, because it immerses the player into interacting with the game universe, and we don't have enough of that, I think. Also, the potential isk is very nice. It'll be interesting to see how CCP tweaks this mechanic over time. I just hope I don't miss out on another isk faucet while its hot! Totally agree on all points. The hacking game presents NO challenge at max skills +T2 equipment, and I suspect be an utter pain in the arse at low skills. The can spew? Ugh. We're explorers. Not twitch monkeys. Right now, apart from lowering the entry barrier to new players, this is something of a bolt on (new shiny interface and a couple of new tools) as far as exploration goes. The base stuff is still there - and mostly unchanged. If prevention of T3s into the 3/10 and 4/10 sites is designed to prevent competition, all it will take to get around it is dual boxing a scanning frigate and a HAC to run it. Net result - new player is still likely to lose out. Odyssey imho is a success as far as numbers online and hopefully subscriber numbers. Huge congrats too on how they've managed the ship rebalancing. But as far as exploration itself goes - I think we need to see that something special that leverages off the exploration changes sooner rather than later... or at the very least, the message for whats upcoming managed well enough to keep the bittervet explorers happy in the longer term. I have level 3 in hacking and analysis, so only T1 equipment. I explore in a Buzzard with level 4 skill in Covert Ops. I have hacked spew containers in lowsec, wspace and mostly null. The lowsec ones are very easy; I get practically all of them. Wspace I only did once and I was inexperienced, so I won't generalize it. Even in null, I usually succeed. I fail on maybe 30% of the tries; this means I end up getting the puzzle first time about 70% of the time, after one failure in about 20% of the time, and I fail completely (spew container goes boom) about 10%. There does not seem to be any penalty for a single failure. For players who enjoy playing endless hands of Solitaire on the computer, the mini-game might be fun. For those of us who prefer games which present a bit of a challenge and require an IQ over 50, not so much. But, I won't say that it is the worst new feature of Odyssey. The honor of the worst feature goes to the new stargate jump effect. Watch it once, ok. But, being forced to watch it over and over and over again, as you travel across a region, without an option to turn it off - absolute torture. Please, please, PLEASE tell CCP to add an option ASAP to shut the damn thing off. "The honor of the worst feature goes to the new stargate jump effect." This. I second the motion for a button to turn it off. The effect is only worsened under TiDi. "No, I don't know that CCP is going with mini-games..."
Let's see... Unifex exits as chief head honcho for CCP's flagship product, to head up a new mobile development effort. Hmm... is really that hard to see a connection between this and the introduction of mini-games? In the (near) future, I expect we'll see new sites/content where you need to play the mini-games, but on your smartphone rather than on your PC. At $1 USD/EUR per downloaded app, it will supplement EVE's subscription income nicely. "...it didn't quite fit with the rest of the game in the opinion of a lot of players." and "For a while, there were rumors and even a very crude prototype of an EVE avatar exploration mini-game where you explored the interior of a Sleeper station." So you saw WiS as a mini-game? Walking in Stations was not a mini-game, it could have been an Avatar based expansion of the EvE universe... Yes, we have DUSTers connected to us but those are not EvE players. What I saw in WiS was a far deeper Immersion into EvE as a 'verse with a multilayered 'reality'... Instead of being limited (yes, I said LIMITED) to just spaceships, we would have had an expanded world to play in.. much like your recent post regarding the idea of EvE pilots flying in atmospheric ships in support of DUST battles... again, deeper Immersion. Personally I have not run a Data site yet... we had a basically 3 day Merc Op killing and evicting some corp from a hole and have only recently returned home... I hope to get some experience with these, but there is a significant difference from Data sites in Anoikis and those in Empire space... we still have Sleepers defending ALL of our sites, and as we are inna C6, whether or not you can catch all the cans solo is not the issue killing them, safely, is not solo task. I hear it is quite a drag in w-space. Most relic/data sites have 15 or more cans wich means you are there for hours. Wgile the loot that comes from them is nor very good. Many people are avoiding those now... . This is what a cargo scanner is for. Scan all the cans and only do the ones with decryptors in them, in particular Caldari ones, but the others are still worth getting. Like I said, haven't run one yet... but I will soon and will probably do a post and so much is written about what happens in Empire... and so little about Anoikis... That's why I started my blog. Many people avoided them in all but the most lucrative sites anyway. This is not a change. 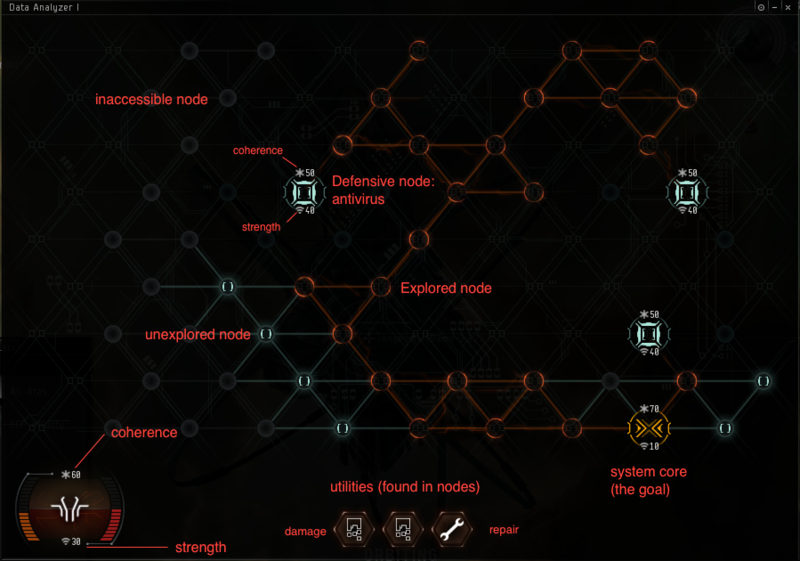 I like the hacking game as a nice change of pace and I do feel that it "fits" into EvE just fine. It had never crossed my mind that it didn't fit the theme or feel. My only suggestions is to find a way to make it a tad more skill/strategy based than its current incarnation. The lootsplosion isn't to bad either and I can reliably grab all the cans that spawn in w-space sites with just my two characters. I do accept that maybe my threshold for what counts as "to many clicks" has been altered by PI and salvaging sleeper sites. As a solo explorer before Odyssey, I was a bit nervous about this expansion. But I have to say: I like it. I am not wild about the loot spew, but the old system of 60 seconds hacking a can then another 2-3 minutes mindlessly killing frigates that spawned and then opening the can to find out it is EMPTY - that really sucked. At least now it is more interesting. It seems like I see both more sites and more people exploring too. I take that as good for the game. @H "If prevention of T3s into the 3/10 and 4/10 sites is designed to prevent competition, all it will take to get around it is dual boxing a scanning frigate and a HAC to run it. Net result - new player is still likely to lose out." - I agree, but it was necessary to allow Gnosis explorers (likely to be new players) to have a chance. It is a good cheap all-in-one ship. Wish I would have had that instead of a scanning in frigate and then going back to get my Drake when I found something. Oh I agree. I'm just pointing the easy way to get around it (no I can't think of a better alternative I'm sorry to say). New players in a Gnosis are likely to go all explody if they hit a 4/10 and possibly even in a 3/10. Which means either it'll be a veteran hitting them or the dual boxing alternative. I like the minigame (already posted about it elsewhere). It is not EVE as I knew it, but then EVE as I knew it was the spinning circle. Not exactly something to trumpet. And yeah, I fancy myself as pretty good at it too. It's a Lake Wobegon game: so easy that everyone can feel himself above average. CCP says they will iterate on it, and I hope they do, to induce more strategic challenge. But even as it is, I admit I look forward to playing the minigame. It's fun. If I had that app on my phone, I might play it while standing in line. It's a nice break from the game of hopping from system to system looking for data and relic sites in a system so empty it is safe to hack. I really dislike the loot spew. This is partly on "realism" grounds, but also on the play itself: it is annoying and clicky. I am getting better at it, though, and have to say that I don't think it really fulfills its main reason for being: to punish solo play. For one thing, by using a cargo scanner and ignoring a lot of the containers, I believe that a well-trained solo player will get most of the value of the loot. (Note that I am not there, yet, and still lose a lot of value. But I foresee getting better.) It is true that you can get almost all of the loot with 2 players. However, I have also used an alt to help collect it, and while that is not quite as effective as a second person, it is still very helpful. I am now seriously considering training up my alt so it can follow me around nullsec to grab stuff from cans. If the hose-soloers aspect of the loot spew does not even really work, then I see no good reason for it. And it totally makes no sense in terms of the asserted in-game reality. Remove it, or make it into a failure mechanic. The cooperative aspect of it (and there should be that) should be in the minigame itself. I was thinking about exploration while doing it last night in nullsec, and I realized something that is worth sharing. I am a carebear, more or less, meaning I don't see a lot of point in PVPing for its own sake. As I said, I was in null, exploring. The proximate reason was that I wanted to explore, and exploring in null seems less dangerous than in lowsec. Lowsec is full of pirates; I've already been killed once exploring in lowsec. Nullsec (at least where I was) was almost abandoned. It is far easier to find a system with only me in it in null, and that is what you need for proper carebear risk management. Anyway, there I was in null, and yet I have never gone into null in the entire time I have been playing EVE. (Except a few times getting to/from a wormhole.) This is because all of the sites I might want to attempt were hard enough that they cannot be soloed in a ship cloaky enough to persist in hostile territory. Because CCP removed all the rats from exploration sites, there is now a good reason for carebears who don't live there to go to nullsec, and they can do it solo, in ships that can reasonably expect to get in and out. I buy into the "food chain" theory of EVE PVP: you need weak ships out in space to attract gankers, who in turn attract solo PVPers, who attract small fleets, etc., on up the fleet-size spectrum. From this perspective, the new exploration should be a big win for PVPers, because it seeds the food chain. I don't like the minigame. I may be in the minority but I don't plan on doing much exploration going forward. There is plenty of other stuff to hold my interest in EVE, fortunately. interesting take on a feature that is doing its best to drive me out of EVE completely. To be completely fair I was on another downward spiral, but I thought I'd hold on for the 'exploration expansion'. It might be an exploration expansion for people who didn't explore previously. But for me it has broken a pass time I loved...oh well all things must pass. 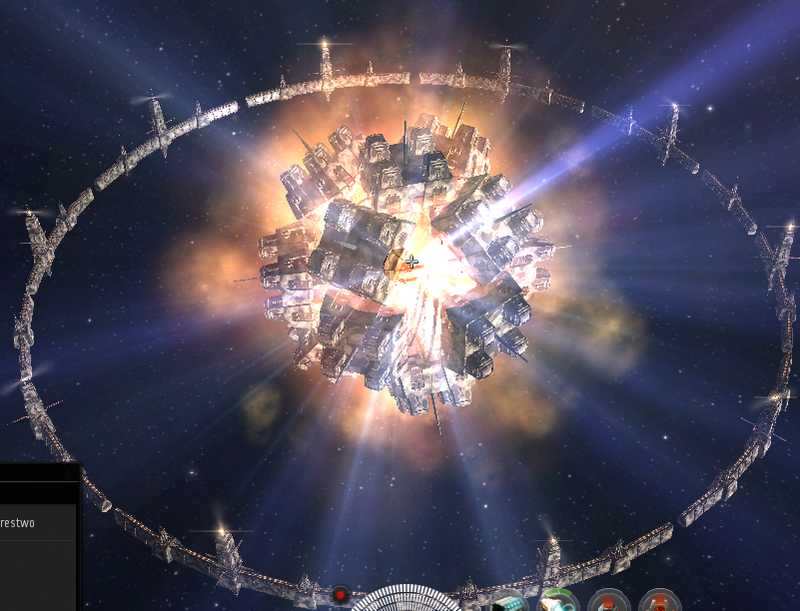 I agree that the new mini-game feels a bit odd when compared to the usual Eve gameplay. However, once iterated upon, and allowing more strategic choices in its resolution, it could merge very well. The dev(s) who had this idea will get a beer from me, sure... thrown right through his face. I agree the lootsplosion is a problem. Im hoping they will fix it but its CCP so i doubt it. After skilling up to near perfect skills, finding 'just the right' ship and devoting hours a day searching for my next area that will bring me that much closer to a plex, I'm done with it all. Why? because exploration reboot was done poorly. 1. It is totally not Eve in any way shape or form. This 'mini-game' has nothing to do with 10 years of Eve lore, game mechanics or ANYTHING to tell the truth. 2. older players who committed to exploration just got gut punched because EVERYONE can see the sites now; no skill needed ... you don't even have to train the skills to know the sites are there. This should have been a sliding scale effect ... more skill, more sites. 3. the pinata. Great idea if you believe everyone should get a gold medal. Why do I say that? It should have been done as an effect because you FAILED, not because you succeeded (which is the only way to fix it IMO). 4. The entrance to the mini-career is pretty unusual ... not in the skills you need to learn to do it, but the skills you need to fit a ship correctly and competitively. Your Archeology and Hacking skills aside (even thought its max skill mandatory for the virus program now), cargo scanner, cargo expander and some type of agility mod are now pretty mandatory. Why? because of the loot pinata. But here is the kicker: We are not going to tell the players that in the tutorial.